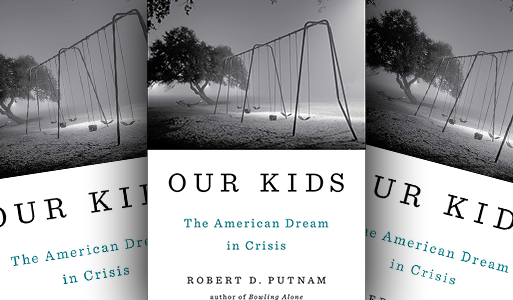 Robert Putnam, Our Kids: The American Dream in Crisis. New York: Simon & Schuster, 2015. 386 pages. As an idea, the American Dream – the belief that everyone has the opportunity to be successful and even the poorest of Americans can improve their lot through hard work – is still a potent force. 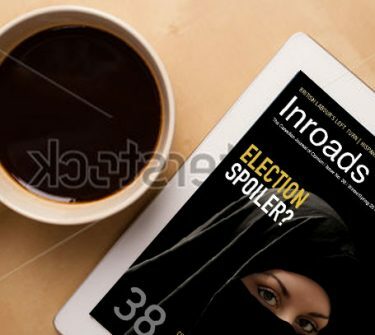 It has been a factor in the 2016 presidential marathon, most strikingly in the campaigns of Marco Rubio, who maintained that his own rise from humble origins as the son of a bartender and a maid showed that the Dream was very much alive, and Bernie Sanders, also the son of immigrants, who argued that growing inequality has closed off the Dream for most Americans. It has been well documented that more unequal societies have higher rates of homicide, school dropout, mental illness, infant mortality and many other health and social problems than do more equal societies.1 Were it not for the continuing belief in the American Dream, the widening gap between rich and poor might well have led to stronger political pressure to achieve a more equal distribution of wealth and income. But does the Dream have any foundation in reality? Can initiative and perseverance still raise a poor individual to the middle or even upper ranks of social class? Or is there a wall that has grown so high that few can climb over it? These are the core questions that Robert Putnam addresses in his book Our Kids: The American Dream in Crisis. Robert Putnam is the Malkin Professor of Public Policy at Harvard University’s John F. Kennedy’s School of Government. He has been a member of the Advisory Council on Environmentally Sustainable Development at the World Bank, the Council on Foreign Relations and the Trilateral Commission. Among his books, the best known is Bowling Alone: The Collapse and Revival of American Community, where he made the claim, supported by extensive research evidence, that American society was suffering from a dangerously declining level of “social capital” – the connections that are built among citizens through their membership in community organizations such as churches, neighbourhood associations and sports groups (including bowing leagues). Declining social capital, he argued, is associated with a host of social ills, from rising crime levels to poorer health to declining economic prosperity. In Our Kids, Putnam continues in his efforts to identify key trends in American society that endanger the health and well-being of its citizens. The first chapter begins with Putnam’s reminiscences of Port Clinton, Ohio, the town in which he grew up in the 1950s. The Port Clinton of the 1950s was a place in which income disparity was relatively low and youth from every economic stratum went to school together, played sports together, belonged to the same scout troops, attended the same churches and knew one another. Putnam briefly recounts the stories of two individuals, Don and Frank, who graduated from Port Clinton High School in 1959. Don, the son of a factory worker with only an eighth-grade education, lived on the poorer side of town. He did well in school and, mentored by a minister from his church, continued his education at a religiously affiliated state university. Then he went to seminary and had a successful career as a minister. Frank came from a more privileged background: his father managed a number of family businesses and his parents were among the wealthiest and best-educated citizens of Port Clinton. An average student in high school, Frank went on to take journalism at a small Ohio college. He worked as a newspaper editor for 25 years and then, in semiretirement, returned home to work in the family businesses. In comparing the two stories, the most striking impression one has is how similar Don’s and Frank’s lives were despite the differences in family income. They lived a few blocks from each other and went to the same high school. Both went on to college and had long and successful careers. A survey of Putnam’s high school class showed that the great majority became better educated and earned higher incomes than their parents, some of the poorer kids doing even better than their wealthier classmates. It would seem that in the Port Clinton of the 1950s, the American Dream was alive and well. Through the 1970s and beyond, this picture changed. Big manufacturing industries in the town closed down, unemployment climbed and the wages of those who did manage to stay employed fell. Putnam goes on to tell the stories of two youths, Chelsea and David, growing up in the Port Clinton of today. Chelsea lives in a large, expensive home in an exclusive part of town overlooking Lake Erie. Her father is a sales manager for a national corporation, her mother a special educator in private practice. Both parents, particularly her mother, have been actively involved in her schooling and have encouraged her to become involved in a wide variety of school activities, such as the high school yearbook and student government. David’s life could not be more different from Chelsea’s. His parents separated when he was very young, and he mostly lived with his father, who was involved in drugs and criminal activity and consequently in and out of prison. When his father was in prison, David lived with his grandmother in an impoverished area of town. David went to several different elementary schools, started hanging out with the wrong kids and spent time in a youth correctional facility. When he left school, he worked at a number of temporary, low-paying jobs. He frequently feels that he’ll “never get ahead” and that he gets no credit for working hard when he has tried to improve his life. Comparing the Port Clinton of his youth with the Port Clinton of today, Putnam finds that there are now two Port Clintons: one for its wealthy citizens and one for its poorer citizens. In contrast with the Port Clinton of the 1950s, citizens from these two communities rarely meet, live very different lives and have very different prospects. Putnam goes on to examine the broader picture of America, and discovers that the bifurcation of Port Clinton into two Port Clintons is mirrored in the way the country as a whole has split into “two Americas.” He cites economist David Autor, who found that between 1980 and 2012 college-educated American men experienced a 20 to 56 per cent increase in earnings, while men with a high-school education or less experienced an 11 to 22 per cent decrease in earnings. This separation of classes in terms of income is reflected in other aspects of American society. Rich and poor live more separately than they did 50 years ago: they are segregated in terms of the neighbourhoods they live in, the kinds of schools they attend, whom they are friends with and whom they marry (with significantly fewer cross-class marriages). Putnam discusses the ways in which families, parenting, schooling and civic engagement have changed for Americans over the last four or five decades. Focusing in turn on four different communities, he tells the story of individual parents and children from across the class divide living in those communities: Bend, Oregon; Atlanta, Georgia; Orange County, California; and Philadelphia, Pennsylvania. 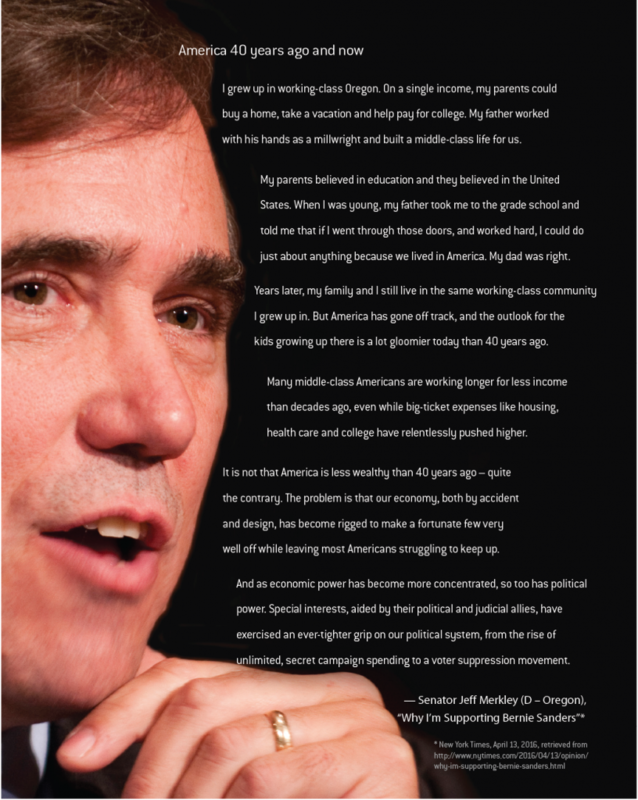 He then examines national trends and discovers the ways in which rich and poor differ in terms of the opportunities they have to improve their lives – finding, for example, a dramatically widening gap in the percentage of children living in single-parent families between those with higher levels of education (a college degree or better) and those with the lowest degree of education (a high school diploma or less). A relatively small percentage of young children (less than 10 per cent) of college-educated parents live in single-parent families, and this percentage has not increased greatly in 60 years. Among parents with a high school education or less, the percentage of children living in single-parent families has increased from around 20 per cent in 1950 to nearly 70 per cent in 2010. We know that children who grow up without their biological father or who spend a part of their early years in a single-parent household do more poorly at school and have more behaviour and emotional problems. In the longer term, these kinds of outcomes during childhood translate to lower earnings and greater economic hardship in adulthood. The growing gap between the rich and well educated on the one hand and the poor and uneducated on the other is shown in many areas. Rich parents encourage their children more, restrict them less, read to them more, help them get involved in extracurricular activities, eat more family meals with them and spend more time with them. We know from a large body of research that the kind of guidance and stimulation that parents provide their children has a profound effect on their development, and even affects their brain architecture. Children who lack this kind of stimulation are more likely to develop learning difficulties, behaviour problems, physical and mental health problems and poorer problem-solving ability. In later chapters, Putnam compares the schools and communities in which children from wealthier, more educated families live and learn with those in which children from poor, less educated families live. He finds that wealthier parents have more information about the quality of schools in their area and choose to live in neighbourhoods with better schools. Poorer parents have less choice in where they live and what school their children attend. Consequently, schools become segregated according to social class, with advantaged children clustered in one set of schools and poor kids in another. These schools differ in many ways. Compared to schools populated by wealthy children, schools populated by poor children have less parent involvement in the school, offer fewer academic programs, provide fewer extracurricular activities and have higher levels of delinquency and transience. Given this kind of school experience, it is unsurprising that few poor children go on to get a college degree. Only around 10 per cent or fewer of children in the bottom income quartile attain a college degree, and this percentage has not changed much in over 30 years. In 1970, 40 per cent of children from families in the upper quartile of income obtained a college degree, and this percentage increased to over 70 per cent in 2011. The gap between rich and poor in obtaining a college degree, then, has grown from 30 per cent in 1970 to over 60 per cent in 2011. Substantial differences have also begun to appear in the communities in which rich and poor children live. Communities are an important source of “social capital” – the connections that individuals have with other people and the resources that such connections can provide. A wealth of research shows that individuals and communities with higher levels of social capital are healthier and have fewer problems than do those with lower levels. Once again, we see a large and growing gap between rich and poor in the kinds of social networks to which they have access in their communities. Wealthier, more educated parents have much broader social networks than do poorer, less educated parents, and they use these networks to provide help for their children when needed, gain access to jobs and educational programs for them and give them a wide variety of recreational, volunteer and training opportunities. In turn, these kinds of supports and opportunities lead to greater success in adulthood. Neighbourhoods in the United States have become increasingly segregated over the last several decades, with fewer affluent families living in or near poor neighbourhoods and fewer poor families living in rich neighbourhoods. Affluent neighbourhoods provide many resources for their children, from parks to recreational activities to youth organizations. When children partake of these activities, they acquire skills and social connections that help them get ahead in life. Poor neighbourhoods don’t have nearly as many of these resources, and are instead rife with crime and violence, which makes neighbourhood children less likely to trust or connect with their neighbours. The picture of America that Putnam paints is one in which the American Dream is alive and well for children of wealthy, educated families, but critically ill for children from poor, uneducated families. Five or six decades ago, children from poorer households could expect to lead a stable, productive life, with many of them becoming more successful than their parents and moving up the ladder of social class. Today, the children of poor families face so many barriers with regard to their family resources, the kind of parenting they receive, the schools they attend and the neighbourhoods they live in that just surviving seems to be the best that they can hope to achieve. In the last chapter of Our Kids, Putnam asks “what is to be done” to overcome the many barriers that face poor families. He describes a wide range of programs for families, parenting, schools and communities that research has shown to be successful in improving the prospects of children from poor families. These include increasing the child tax credit to raise the incomes of poor families, particularly those with children under five; providing more high-quality, centre-based daycare for poor families; extending school hours to provide more extracurricular activities in schools in poor neighbourhoods; and moving poor families to better neighbourhoods. Putnam’s tale of two Americas is a compelling one. By mixing personal stories with extensive survey results, he paints a clear picture of how America has changed, particularly for the children of poor families. The stories are especially important, giving us a sense of the desperation that poor kids feel when all the avenues to a better future are closed to them. In some ways, Putnam is only telling part of the story. Missing is information about how families in the middle education and income classes are doing. The one chart he provides that includes all income levels (showing college degree rates) suggests that families in the middle income levels aren’t doing all that much better than families from the lowest level. Only families at the top level of income have experienced significantly better outcomes over the years. While many of the solutions that Putnam offers seem reasonable, as a whole they don’t seem nearly enough to deal properly and comprehensively with the problem. For example, his suggestion about moving poor families to wealthier neighbourhoods may help a few poor families, but how could this strategy be used to help entire poor neighbourhoods? Our Kids focuses only on American families. Are there lessons to be taken from this book by other countries such as Canada? There are a number of reasons to expect that Canada does not have the same barriers to progress for poor families that America does. While the United States is one of the most economically unequal societies in the developed world, Canada is only average in this regard. Canadians like to think that they have a stronger health and social safety net than does the United States, so this may mitigate the impact of poverty on poorer Canadians (although according to OECD figures, the United States spends a greater proportion of its GDP on social welfare than does Canada). There are also indications that our public school system is more equal and more effective. But despite these differences, Canadians should take note of the results described in Putnam’s book. While it has less economic inequality than the United States, Canada’s level of inequality is increasing rapidly. Our Kids is a cautionary tale for Canadians, for it may describe the direction in which Canada is heading if Canadians and their government don’t heed its warnings. 1See, for example, Richard Wilkinson and Kate Pickett, The Spirit Level: Why Greater Equality Makes Societies Stronger (New York: Bloomsbury Press, 2010).